Home / Health / Kitchen Sponge: Ways to keep them as clean as possible. Kitchen Sponge: Ways to keep them as clean as possible. While a sponge is excellent for wiping up messes and absorbing liquid quickly, it can also absorb harmful foodborne pathogens along the way. Nothing is more disgusting than a stinky sponge. As it turns out, that smell is a warning: Your kitchen sponge is likely the single dirtiest item in your whole house. A wet and stagnant sponge grows new bacteria at the absolutely horrifying rate of once every 20 minutes, according to Dr. Philip Tierno, a clinical professor at the Microbiology and Pathology departments at NYU Langone, and author of, The Secret Life of Germs. Meaning, if you’re just using a sponge to clean your dishes, they might end up grosser than when you started. Though you can't eliminate 100 percent of germs lurking in a sponge, there are several ways to dramatically reduce the risk of cross-contamination — which can lead to food poisoning — with these dos and don'ts. 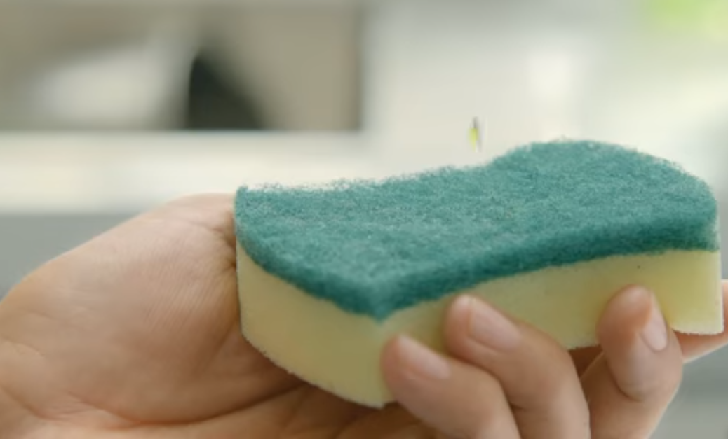 To lower the risk of cross-contamination, you should sanitize your sponge. While testing common household methods used to disinfect sponges, researchers at the USDA found that over 99 percent of bacteria, yeasts, and molds were killed by microwave heating damp sponges for one minute or dishwashing with a drying cycle. Sponges may also be disinfected with a solution of one-quarter to one-half of a teaspoon of concentrated bleach per quart of warm water. Soak the sponge for one minute. Even after two or three uses, your sponge may be teeming with bacteria. 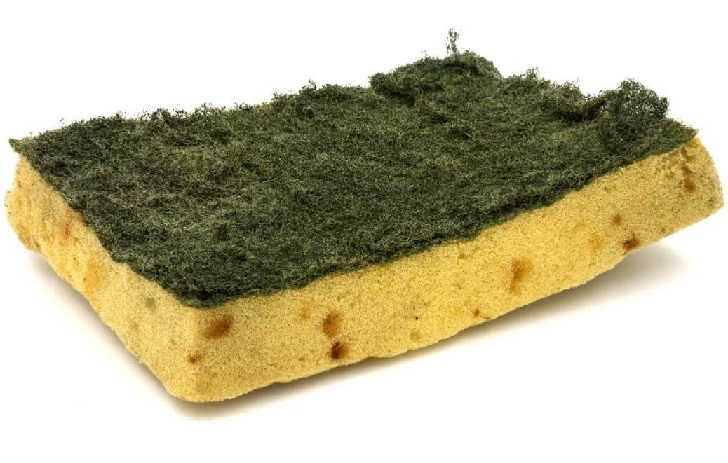 And while cleaning your sponge daily help reduce the risk of food poisoning, you should consider replacing your kitchen sponge regularly. If your sponge starts to smell at any point — toss it out immediately. It's important to not only wring out your sponge completely after each use and wash off any loose food or debris, but you should also store it in a dry location. Letting your sponge lay wet on a countertop takes longer for it to dry and allows harmful bacteria to multiply quickly as well as increases the opportunity for bacteria growth. Also, avoid leaving any damp sponges in an enclosed area such as a bucket or under the sink. Cleaning up spills from ground beef or poultry with a sponge can increase your chances of spreading harmful foodborne pathogens. Instead, use a paper towel or disinfectant wipes to clean up spills and other bacteria-loaded messes. Many sponges contain millions of bacteria — and it only takes a few to get you sick. Avoid spreading those germs and bacteria to countertops by using a paper towel or disinfectant wipe to reduce the chances of cross-contamination with your sponge. While less porous than sponges, you should still launder dishcloths frequently as they can harbor enough harmful bacteria to make you sick. Remember to wash in hot water and dry them on high heat in the dryer and consider having separate dishcloths for different purposes (e.g. hand washing and dish drying).